Lovely decorated table for a Halloween Tea. The recipes looks and sounds delicious! 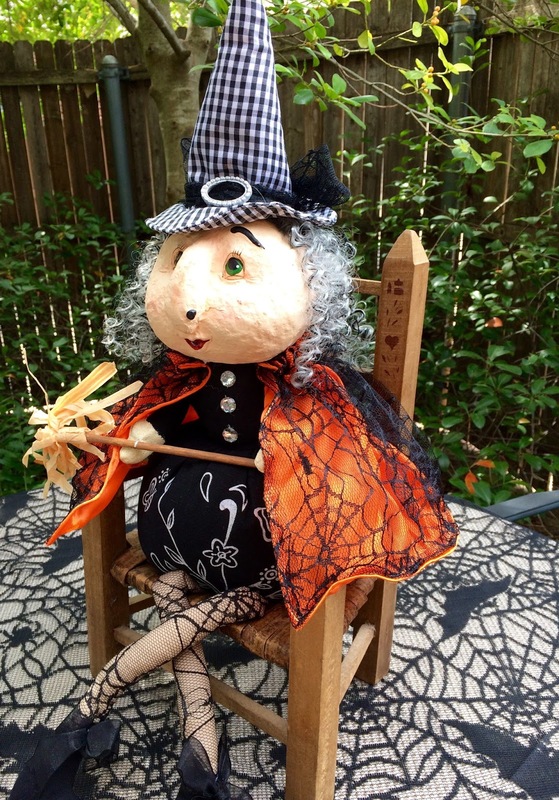 Kitty, I'd love to fly right over to join you and your friendly witch for tea! I admired your painted teapot and Mike's talent when you shared it! Your pumpkin cookies with brown butter icing are oh so tempting! Those cookies sure look good, Kitty, and I love the teapot your son painted! It's simply charming! Our warm weather is long gone now and the high winds are ripping the leaves off the trees. We won't be able to enjoy the foliage much longer which is too bad. But inside it's nice and cozy and I have Christmas to think about which is always a lovely time of year. Thanks for stopping by and have a beautiful day, dear Kitty. What a wonderful treat! It is a cool autumn day here in Indiana and this sounds great with a hot cup of tea. Have a beautiful week, Kitty. You've created a fun and whimsical table for tea this week Kitty. I just happen to have 1 cup of pumpkin in the freezer from something else I baked so your cookies may be on our table too! What a cute table! Darling! I love your teapot. What a talented son! The cookies are perfect for the season...keeping the recipe! Thanks so much for linking to Tuesday Cuppa Tea and have a wonderful week! Kitty you always mange to set such a fun table and serve the most delightful treats! Hi Kitty, what an adorable setting for tea. I love your darling friendly witch. She is adorable in her gingham hat sitting so sweet. Love the cup from Debbie. What a beauty and does go with every kind of setting. I love the tea pot your son painted. What a treasure it is in MC style. Your tea setting is spooktacular, Kitty! The Friendly Witch made me smile. Too cute! And you know how I love all things pumpkin! Oh how yummy. 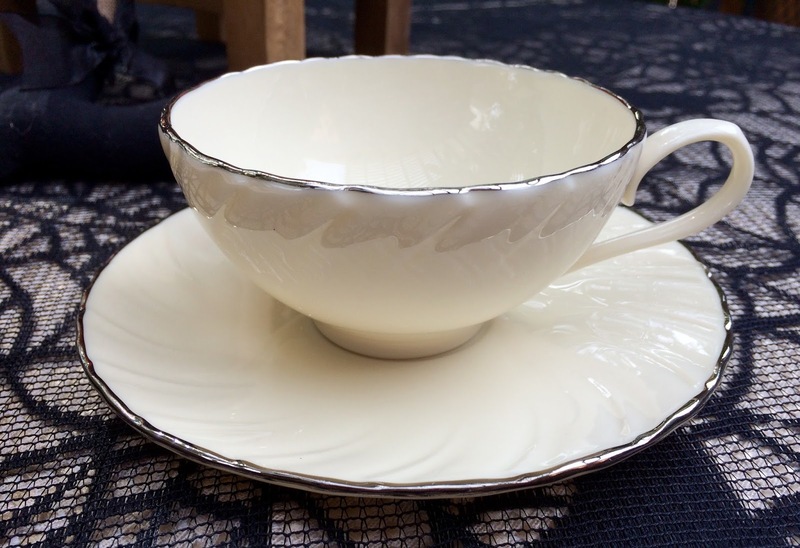 I am so getting into tea pots and cups! I am inspired by all the bloggers posting about tea pots etc! I loved this. Come over and link at The Fabulous Fall party. Nothing scary about this tea, just adorable. Great theme with the oh so cute witch and I love the tea kettle painted by your son, so thoughtful and sweet. The pumpkin cookies look yummy, thanks for the recipe. Have a great week. Those pumpkin cookies look delicious. Love your cute decorations. Your son did a marvelous job on the kettle! I love pumpkin anything! 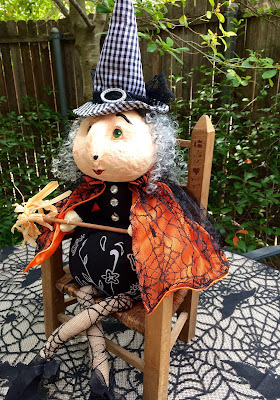 Cute witch, and the teapot looks just like the real thing! Kudos to Mike! Such a cute table setting, Kitty Now if we only had some fall weather to go with it. I still can't believe Mike painted that pretty teapot. Such a great look! Have a wonderful week! Your little friendly witch is adorable. Wishing I had one of your cookies as I type. Yummy! Hey Kitty the pumpkin cookies look amazing. Thanks for sharing the recipe at C&C with J&J. Enjoy the week. Cookies is one of my favorite ways to have pumpkin! I will have to try your recipe! And, your cookies look delicious! 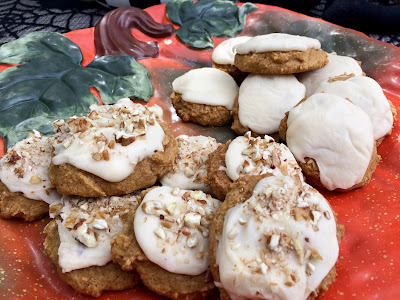 Iced pumpkin cookies sound delicious - a perfect little treat for this time of year! How talented your son is to paint the teapot like that! I am drooling over your cookies Kitty. Wish I could eat them...not any more, but I love looking at them. Everything looks so nice. Hey sweet friend, we haven't visited in a long time ! 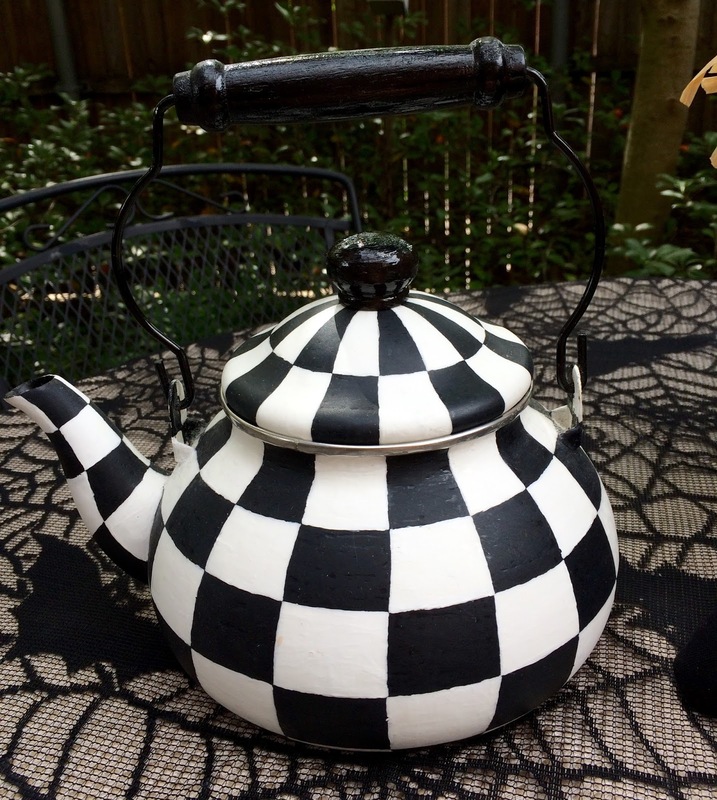 I'm loving your Halloween table, specially the kettle your son decorated for you in black and White. I've done a few things in the Mackenzie look too... loving it! What a colorful and fun table with all your decorations. The cookies look delicious as you are always the "Queen of Baking"! Thanks for sharing and linking. What a darling table setting for tea time! The teapot your son painted is so cute! Looks like he is very talented! 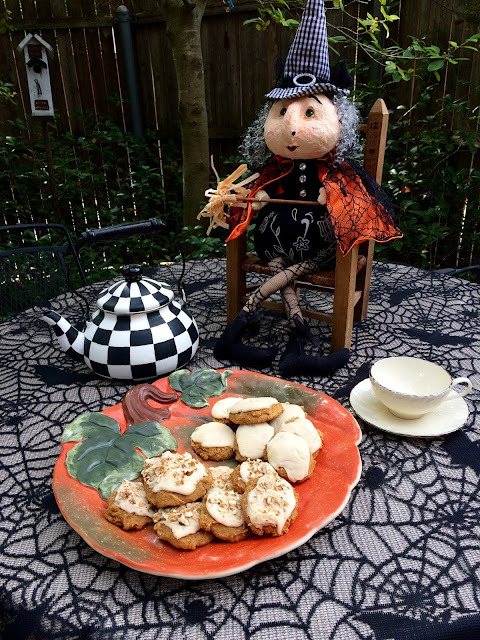 So fun to have tea with your little witch! Your cookies look so good and perfect for tea! Happy halloween to you! Kitty, Mike did such a fabulous job on the kettle! Gorgeous! And these cookies sound so perfect with a cup of tea. These cookies look so delicious Kitty. Add icing to anything and I am sold! :) Especially brown butter. I am always amazed at how fabulously your son painted that tea pot. Thanks for sharing with SYC. You always have the best recipes. The cookies are making my mouth water. I love your witch. She made me smile ... wart and all. I think I need a hat like hers! :) Happy Halloween! The cookie icing is similar to one I received almost 50 years ago from a friend of my mother. The icing with pecans MAKES the cookie. Thanks for sharing at Monday Social. The cookie recipe looks amazing. What a lovely and adorable Halloween setting the cookies have been placed in. Another wonderful recipe. Such a cute Halloween setting Kitty. Love your sense of whimsy. Thanks so much for sharing at DI&DI. Looks like you are ready for the trick or treaters tonight. I feels like the 4th of July instead of Halloween, hope you are enjoy this fall weather. Thanks so much for sharing with us at Full Plate Thursday and have a great week! Your cookies look delicious. The friendly witch is priceless. Thank you for joining Monday Social!